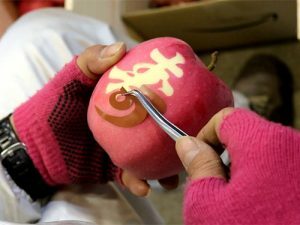 We have introduced to you the process of applying seals on the surface of apples in the previous article. Now we’ll show you how the apples change color and the designed apples complete the process. You can see the gradual change of colors. The outline becomes faint in the “10 days later” photo, blending with the skin color. 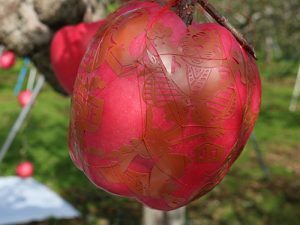 As with the normal cultivation of apples, the process of rotating apples and spreading a sun-reflection sheet on the ground are done in order to get enough sunlight for even coloring. Since the “Stark Jumbo” variety, the picture on the right, has a darker red color than that of “Mutsu”, the seal looks more similar to the fruit color. Now it’s time for harvest. The seals are removed after the harvest. The growers carefully peel the seals one by one so that the fruit remains flawless. Since the areas covered with a seal are left un-colored, the letters and pictures appear clearly on the skin. The beautiful Mojie Ringo apples are complete. This particular one shows an example of an inverted cutout image. The bag was opened widely and an inverted letter seal was placed into the space. The letter became red surrounded by a pale skin. The pictures below show some deformed apples which are usually thinned out. The growers use them for the artistic purpose of Mojie Ringo. 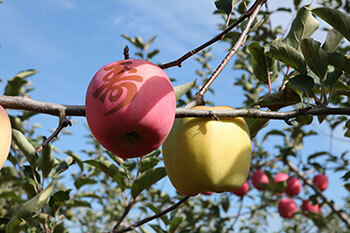 The “Mutsu” variety apple in the picture on the right was accidentally cultivated without a bag. It has grown with the original yellow color. The color difference is quite obvious between the two, with and without a bag. Next time, in No.3 Decoration, we plan to introduce you to the processes of packing and wrapping.